Entertain your guests & help get the party started! Wedding entrances to wow your guests! Weddings are joyous occasions, however guests sometimes need entertainment whilst the Bridal party are busy. A typical wedding show consists of a solo floor show to entertain the guests. This can be with isis wings (think big gold butterfly wings), or even a drum solo or sword balancing act. The Bellydancer then asks the Bride and Groom onto the dancefloor to dance with them, and at this point the guests are also invited up. A Bellydancer aims to have the floor packed with dancing guests by the end of her set, and leave you all dancing the night away. Music can obviously be tailored to suit the particular cultural background, and costumes can be worn that are fully covered. Group Belly dance performance floorshows to entertain your guests and get them onto the dancefloor! 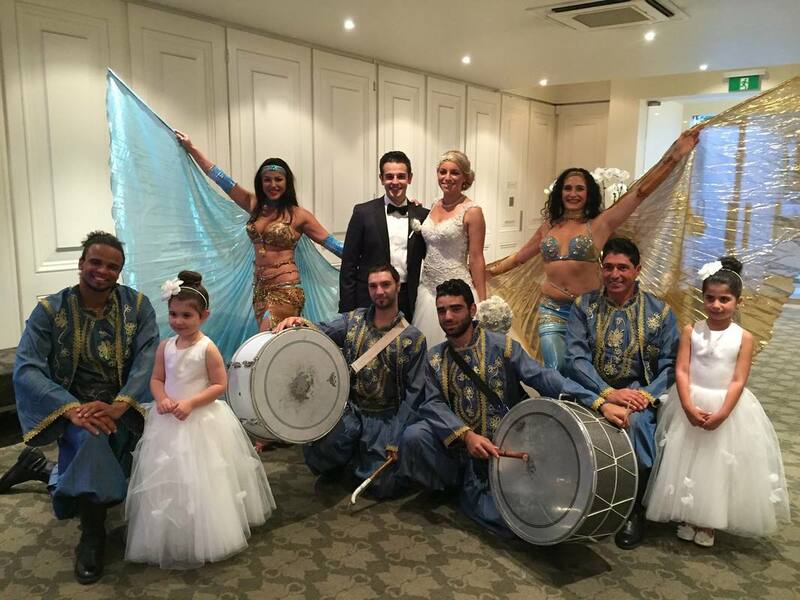 Belly dancer and drummers to get your guests onto the dancefloor!